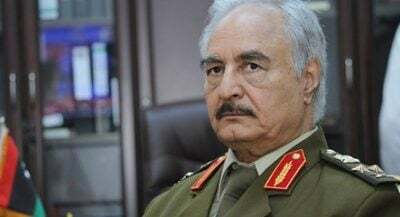 The Mainstream Media’s deliberate misportrayal of Libyan National Army General Haftar as “Russian-backed” is meant to turn him into a bogeyman for the purpose of discrediting his military gains after he turned on his American patron. Much of the Mainstream Media’s reporting about the latest events in Libya usually always includes at least one line about how Libyan National Army (LNA) General Haftar is allegedly “Russian-backed”, which is meant to turn him into a bogeyman in the minds of the West’s intended infowar audience. Haftar used to be patronized by the US (where he spent years of his life after fleeing Libya following a failed plot to overthrow Gaddafi) until “going rogue” a few years back and behaving much more independently in pursuit of what he genuinely believes to be his homeland’s true national interests. Instead of “playing by the rules” and letting the so-called “international community” impose political “compromises” on his country by “recognizing” the so-called “Government of National Accord” (GNA) of militant Islamists and other “socially unsavory” characters as the “legitimate government” of Libya, he vowed to liberate his country from those forces irrespective of whether the globalist authority of the UNSC supports his initiative or not. To be sure, he’s not doing this entirely on his own since he’s thought to have the support of Egypt, its Emirati financial backer, and Africa’s extra-regional “superpower” of France, but he’s nevertheless openly flouting the “official” will of the “international community” with his ongoing liberation campaign and in a sense almost taunting Trump to intervene against him, a quagmire-like trap that the President is prudently avoiding by withdrawing the rest of the US’ forces in the country following the latest outbreak of hostilities. It’s not often that a man can defy the US on the international stage and live to tell about it, but that’s precisely what Haftar has done, though it should be noted that the US is still “tolerating” him because it keenly understands that he’s genuinely popular and commands the most effective fighting force in the country. Furthermore, the US’ “Lead From Behind” stratagem implies that the unipolar hegemon can just leverage its close relations with his three suspected patrons in order to ensure a semblance of “stability” and that he doesn’t get “too far” “out of hand”. What’s meant by this is that the US doesn’t want to see Russia taking advantage of the situation by bringing order to chaos like it’s done in Syria following fake news infowar reports that began to emerge last year about the Great Power “balancer” supposedly eyeing strategic opportunities to “export” the “Democratic Security” model that it’s presently perfecting in the Central African Republic to the war-torn North Africa state next. It should be pointed out that Russia is a rising global diplomatic power but that there are serious limitations to its use of conventional force abroad, hence the low-cost and mostly commitment-free policy of allegedly employing private military contractors (PMCs) in pursuit of its foreign policy ends in conjunction with sustained diplomatic engagement with all of a given conflict’s parties. It can be ruled out, however, that Russian PMCs are active in Libya both because no proof of them operating there has emerged and also because Moscow is unlikely to deploy them in support of an internationally unrecognized military force such as Haftar’s. Even so, the Mainstream Media has an interest in propagating this false narrative because of just how compelling it is in the contemporary context of the New Cold War, delegitimizing Haftar’s military gains in the process as revenge for his “defection” from the US by deliberately misportraying him as a “Russian puppet” who’s violating “international law” at Moscow’s “sinister” behest. In addition, smearing the LNA General in such a manner is meant to downplay his genuine popularity in the country and the objective effectiveness of his military forces, as well as precondition the intended infowar audience into thinking that any setbacks that he might experience are (an ephemeral) “victory” by the Western-backed GNA against the “Russia’s man in Libya”. The West’s exaggerated reporting about Russia’s standard diplomatic “balancing” initiatives towards this conflict are also supposed to create a sense of urgency back home about the need for people to rally behind their governments in advance of any forthcoming multilateral campaign supporting the GNA against Haftar. For all of its recent diplomatic and “balancing” successes in Syria, the Central African Republic, and Afghanistan, Russia has still largely failed to get the rest of the world at large to acknowledge its peacemaking gains and appreciate them due to its historic lack of broad soft power appeal (excepting the impressive ideological sway that it once held during the Old Cold War) and inability to properly articulate its policies to the global masses (due to a combination of ineffective messaging and “political sensitivities” pertaining to “transparency”). That’s why Russia always seems to be in a defensive position responding to Western infowar attacks against it instead of proactively shaping the wider discourse on whatever the issue of relevance may be. Russia’s rhetoric is effusively praised by those who are receptive to it, but its words (mostly condemnation of American foreign policy) are rarely backed up by actions that actually change anything on the ground, thus making them ring hollow. For these reasons, the Mainstream Media will probably continue to deliberately misportray Haftar as a “Russian-backed” “renegade warlord” in order to score cheap soft power points at Moscow’s expense, capitalizing on the country’s inability to properly defend its “balancing” strategy. This rhetoric might initially seem harmless in the grand scheme of things, but it could actually be intended to galvanize Western support ahead of a multilateral “Lead From Behind” intervention aimed at “saving Tripoli” from a “pro-Russian wannabe dictator”, an entirely invented narrative but one which might nevertheless be effective in conveying a sense of urgency in support of this possibly forthcoming US-inspired mission. In addition, it’s much more politically convenient for the West at large to blame Haftar’s gains on Russia than to acknowledge the sharp differences that the US and others have with France, the UAE, and Egypt over Libya, thereby perpetuating the illusion of “international unity” over the country’s post-2011 future in spite of the facts.